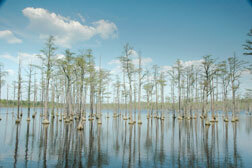 Tucked into a pocket of wilderness between Camden and the northward spread of Columbia, N.R. 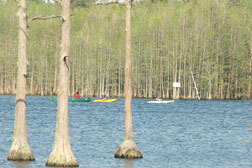 Goodale State Park offers unexpected tranquility and natural beauty. Many people, even those who live in the area, don't know about this little oasis and the opportunities for outdoor recreation available there. Dedicated in 1955 and named for N.R. Goodale, a local forester and prominent political figure, the park has much to offer. To get there from I-20, take US Highway 521 (Exit 98) toward Camden for 2.3 miles. Turn right onto DeKalb Street/US Highway 1 and drive 3 miles. Turn right onto Stagecoach Road and drive 2.4 miles. Turn left onto Park Road and look for park signs. Park entrance is .2 mile on the right. The park office sits on the edge of 140-acre Grist Mill Lake, formerly a mill pond dating to Civil War days. The office is open Monday through Sunday from 11 a.m. to noon, and a kiosk nearby offers a map of the property and other information visitors may need to explore the place safely any time during daylight hours. Also near the office facility are picnic tables overlooking the lake, a playground and a one-mile self-interpretive nature trail. The park's two picnic shelters are available for rent for family or other gatherings, and there's also a meeting building. One of the park's most enjoyable features is the canoe trail that takes visitors across the lake and along a path winding among cypresses and lily pads. Private boats with electric trolling motors are allowed, but the best way to do the trail is by canoe or kayak. These are available for rent through the park office, or you may bring your own. Park managers ask that boaters register before launching. If you rent boats, you'll launch right in front of the office and head out toward the opposite side of the lake to find the trail entrance, like a secret path that's difficult to see until you get close. Those who bring their own boats can drive up close to another launching spot near the dam and spillway. 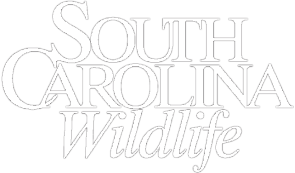 Launching there, paddle around or through a flooded forest of cypress trees, bearing gently to the right across the lower end of the lake to the trailhead. A map of the trail is available at the office and online. Entering the trail, paddlers get wrapped up in a cypress forest filled with bird songs and tiny unidentified splashes as residents vacate their perches in response to the arrival of humans. Diamond-shaped signs on trees clearly point the direction of the trail. In a clearing soon after the trail begins, notice the first of many wood-duck nest boxes placed to provide cavities for wood ducks and other cavity nesters. Keep in mind that the trail is not a loop, so go only as far as you feel comfortable paddling back, and leave plenty of time for your return trip, which is guided by a separate set of signs hanging on tree trunks. Watch carefully for the trail signs, and when you stop seeing them, it's time to turn back. No sign explicitly defines the end of the trail, so stay alert. The whole trail, from entrance to where the signs stop, is about 3 miles long and, depending on how well you paddle and how often you stop to look and listen, could take several hours. It feels otherworldly inside the swamp, as you paddle between tree trunks that press in close at times, beneath a shady canopy through inky water spotted with many types of water-loving vegetation. 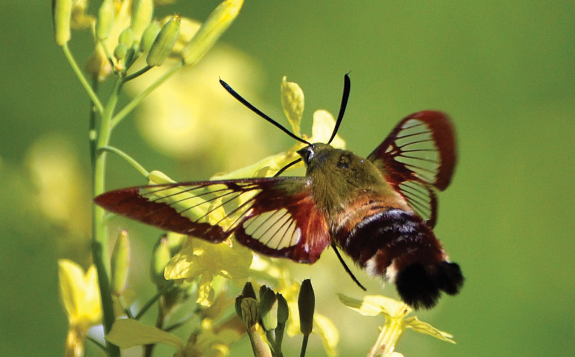 At the bases of many of the larger trees, enough earth exists to host the occasional bunch of pitcher-plants, green tubular carnivorous plants with their tell-tale open lip at the top where they collect their insect dinners. Below, lily pads crowd the sunny spots, with a variety of flowers large and small sprinkled among them: the large, white blooms of the water lily, the sculpted yellow ones of the water locust, and a number of smaller, more delicate flowers scattered in places. At first glance, the pads themselves seem to be of different species, some dark green and some a deep burgundy. In fact, the green lily pads have burgundy undersides, which show when the leaf gets overturned by wind or other disruptions - like paddlers. 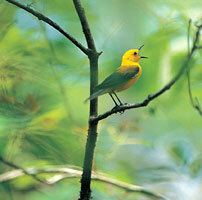 Birds abound in the canopy and low-growing bushes, and quiet paddlers will certainly hear them talking to one another. Fortunate visitors who paddle without chatter of their own might also catch a fleeting glimpse of some of these shy residents, including the vibrant-yellow prothonotary warbler and other songbirds. In summer, especially, be aware that the swamp is home to some animals that are best left alone: alligators and snakes occur here - you might see them basking on the sunny banks of the lake - and red wasps hang their paper-like nests in low-hanging branches. To avoid disturbing any of the swamp's residents, and for your own protection, it's important to stay on the trail and in your boat. Upon returning to the launching point, visitors can walk the perimeter of the lake along the dam side, fish from the bank, or sit at the shaded picnic table and enjoy a scenic spot for a picnic. Anglers regularly catch fish from shore, but be careful not to snag the hook - the bank is a lush plant environment, hosting volumes of water-loving plants. In the shallows, also note the mat of weeds thriving just below the surface in the warm water, great for attracting turtles, fish and other wildlife, but something to be avoided while retrieving a fishing line. With so much to offer, this state park stays surprisingly quiet, so visitors seldom encounter a crowd. During the week, you might be the only visitors on the park property - a refreshing change from the crowds and fast-paced tempo of our lives. 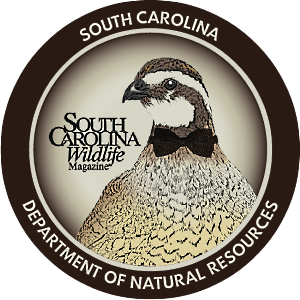 For more information write Goodale State Park, 650 Park Road, Camden, SC 29020; call (803) 432-2772; or visit discoversouthcarolina.com. 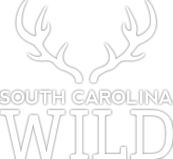 Carolina Foster is a former editor of South Carolina Wildlife magazine.